Due to a rise in sports-related concussions this past decade, health care professionals have been particularly concerned with making athletic competition safer on the brain. Researchers at the Colorado School of Public Health found that high school athletes competing at a higher altitude were less likely to sustain a concussion compared to athletes playing at sea-level. "This is the first time any research has linked altitude to sports-related concussion," said Dawn Comstock, Ph.D., associate professor of epidemiology at the Colorado School of Public Health and co-author of the study. "It appears that when you are at altitude there may be a little less free space in the skull so the brain can't move around as much." Dr. Comstack along with colleague David Smith, M.D., from the Cincinnati Children’s Hospital Medical Center, tracked concussion statistics from 497 high schools included in the National High School-Related Injury Surveillance System. Athlete’s representing high schools from across the U.S. played a range of sports; however, football was analyzed separately as the sport with the highest concussion rate. High school athletes who competed at altitudes 600 feet and over were 31 percent less likely to suffer a concussion. 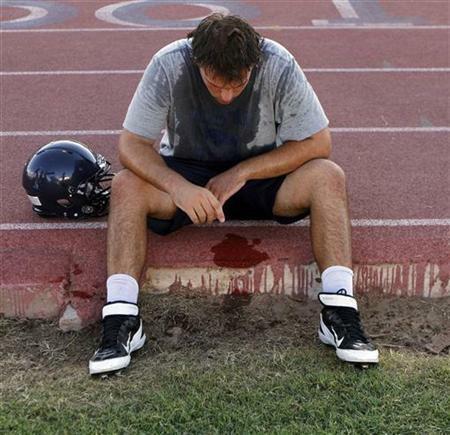 On average, football players competing at altitudes over 600 feet were 20 percent less likely to suffer a concussion. Researchers said concussion reports among sports-related emergency room visits rose by 100 percent among athletes between the ages of eight and 13, and 200 percent among athletes between the ages 14 and 19 in the last decade. "We did see significant differences in concussion rates with elevation changes," Dr. Comstock explained. "This could mean that kids in Colorado are less likely to sustain a concussion playing sports than kids in Florida. There are many possibilities here, but we are just beginning to understand the connections between altitude and concussion." According to the Centers for Disease Control and Prevention (CDC) around 173,285 children and young adults are treated in an emergency department for a traumatic brain injury, including a concussion, each year. In the past 10 years, sports-related concussions among this age group increased by 60 percent. Just over seventy percent of emergency room visits associated with a sports-related traumatic brain injury was attributed to people between the ages of 10 and 19. A concussion usually occurs as the result of an on-field collision where the athlete’s brain collides with the skull. When someone reaches an altitude above 600 feet, blood vessels in their brain begin to swell, the research team reported. As the brain expands, it fits more securely in the skull, eliminating the chances of a violent collision. "Vasogenic edema in the brain leads to increased extravascular water," the study says. "These two adaptations would also lead to a tighter packaging of the brain with increased blood cell content surrounding the brain." The research team hopes to duplicate the methodology of this study using statistics from professional athletes. In order to protect athletes of all ages from a traumatic brain injury, sporting equipment, especially football pads and helmets, has made advancements in its design to reduce the chance of a concussion. "If this study is correct, we should look to replicate our findings in the National Football League," Dr. Comstock added. "For example, if the Broncos play the Chargers in San Diego or the Dolphins in Miami they should experience more concussions than when they play here in Denver." Myer G, Currie D, Clark J, Bailes J, Comstock D, Smith D. “Altitude Modulates Concussion Incidence Implications for Optimizing Brain Compliance to Prevent Brain Injury in Athletes.” Orthopaedic Journal of Sports Medicine. 2013.